January | 2014 | Dorothy Day Catholic Worker Washington, D.C.
Maria Santelli has been director of the Center on Conscience & War (CCW) since 2011. Before coming to DC, Maria lived and worked at Trinity House Catholic Worker in Albuquerque, New Mexico and founded the New Mexico branch of the GI Rights Hotline. For 73 years, CCW has worked to extend and defend the rights of conscientious objectors to war and violence. In draft time, CCW supported those who resisted conscription to war. Today, CCW’s work is with active duty members of a voluntary military who seek discharge as objectors to war. 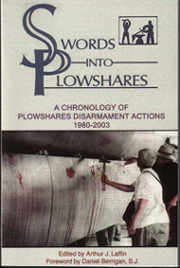 This work puts CCW in the unique and privileged position of sharing rare and valuable insights and information with members of our communities working to build a more just and peaceful world. In the course of CCW’s work, staff are often asked, “Why have empathy for an individual who joined the armed forces voluntarily and now decides he or she cannot fight, cannot kill? Didn’t they know what they were signing up for? Didn’t they know that the purpose of the US military is to fight wars? The answers are complex and vary for each individual. 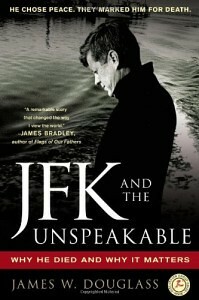 What they share in common, though, is a personal transformation, brought about by a crisis of conscience. And contained within each military conscientious objector’s personal journey are powerful guideposts that can help steer our collective passage from militarism to nonviolence. Date: Friday, February 7, 2014 @ 7:30 p.m.
January 11, 2014 marks the twelfth anniversary of the U.S. detention center at Guantanamo Bay, the eighth anniversary of Witness Against Torture’s January 11 presence in D.C., and our sixth liquids fast. This is not about us. This is NOT about the United States cutting itself out of the patchwork of the family quilt of humanity. This is about 155 men who have been stuck in prison cells in Guantanamo Bay, Cuba for up to 12 years, who continue to count the days, weeks, months and years they must wait to go home. Who are these men? Where did they come from? How and why were they captured so many years ago to be held prisoners in Cuba by the U.S. military? And when will they regain their freedom? Finally, each day we will share a profile of one GTMO detainee and one WAT member. We invite you to discover your connections to the prisoners as we explore our own by introducing ourselves beside them. 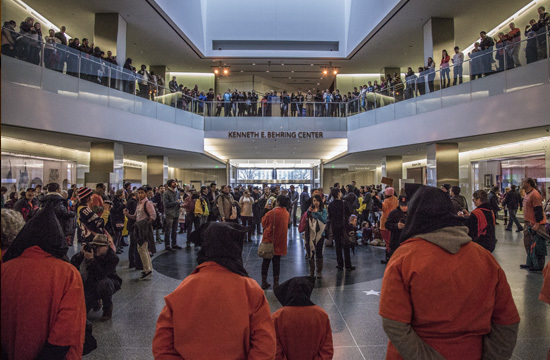 We especially encourage people to attend the January 11 march and rally (see below) to mark the 12th anniversary of the first detainees going to Guantanamo (see below info). For more info see the Witness Against Torture web site: www.witnesstorture.org. 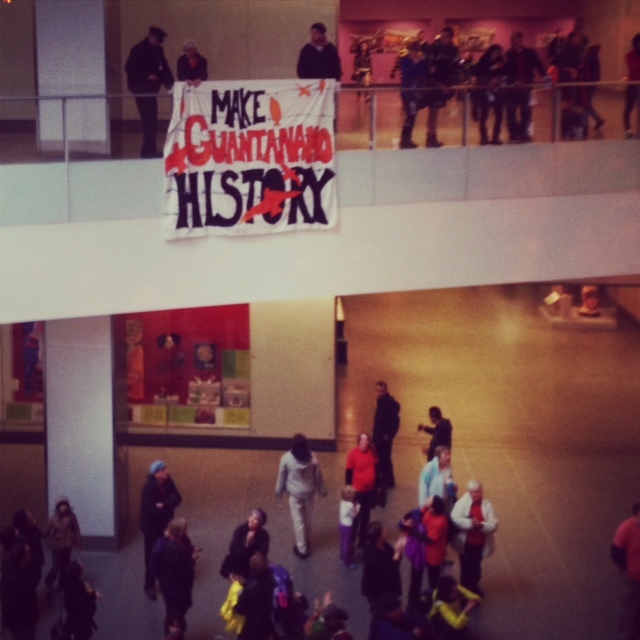 Rally and procession to mark the 12th anniversary of Guantánamo, and to demand its closure. • 1 p.m. – Procession leaves from White House, ends at 2:30 p.m. Sponsoring Organizations: Center for Constitutional Rights, Witness Against Torture, Amnesty International, CODEPINK: Women For Peace, National Religious Campaign Against Torture, the World Can’t Wait. Blue Lantern Project, & CloseGitmo.net . 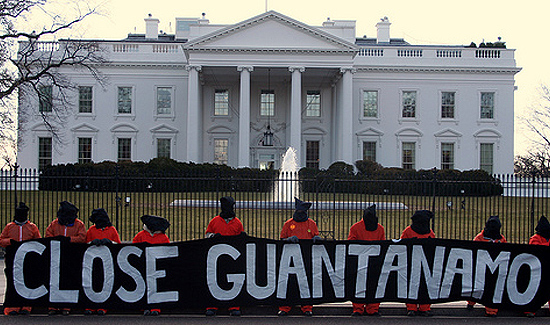 This January 11, 2014 marks the unacceptable 12th anniversary of indefinite detention without charge or trial at Guantánamo. Join us in Washington, D.C. to witness this anniversary together, and to call on President Obama to finally fulfill his broken promise to shut it down. Obama has the power to close Guantánamo, and the new National Defense Authorization Act (NDAA 2014) just approved by Congress makes it even easier for him to do so. 155 men remain detained at Guantánamo; most should never have been detained in the first place and are entering their 13th year of being deprived of their liberty without any charge or trial. They must be tried in a fair court or released; Guantánamo must be shut down. Report of Holy Innocents Faith and Resistance Retreat in Washington, D.C.
About 30 people from the Atlantic and Southern Life Communities gathered for a Faith and Resistance Retreat in Washington, D.C. from December 27-28 to commemorate the slaughter of the Holy Innocents–past and present. The retreat was organized by members of the Jonah House Community, Jonah House and the Dorothy Day Catholic Worker. On Friday, December 27, retreatants processed from Army-Navy Drive to the police designated “protest area” near the Pentagon metro station where a vigil was held from 3:30 – 4:30 p.m. as Pentagon employees were leaving work. When we arrived at the vigil site a large group of Pentagon police were on hand, a number of whom were dressed in riot suits and “ninja” garb. The witness began with an explanation about why we were there and a reading of the Gospel account of the slaughter of the Holy Innocents. This was followed by a period of silence, a reading of the retreat theme (see below) and a quote by Thomas Merton. The witness concluded with retreatants offering their hope-filled New Year’s Resolutions for a nonviolent world and the singing of “This Little Light of Mine.” Throughout the vigil children from the retreat group played on the small embankment behind the vigil area, providing a stark contrast to the armed police presence protecting the center of warmaking on our planet. That evening the group gathered for dinner and reflection at St. Stephen’s church.Ted Walker offered a compelling reflection about the meaning of the Feast of the Holy Innocents which was followed by a moving sharing by retreatants regarding what this feast means for them. Stories and actions were also recounted from past Holy Innocents retreats, including when the first retreat began in the mid-1970’s.The evening ended with a showing of a newsclip from the recent Democracy Now interview with the son and grandchildren who were eyewitnesses to the murder of their mother and grandmother by a U.S drone-strike in Pakistan. The morning of December 28 consisted of prayer, breakfast, action planning and clean-up of the church. The group then proceeded to the White House for an hour-long noon-time witness. 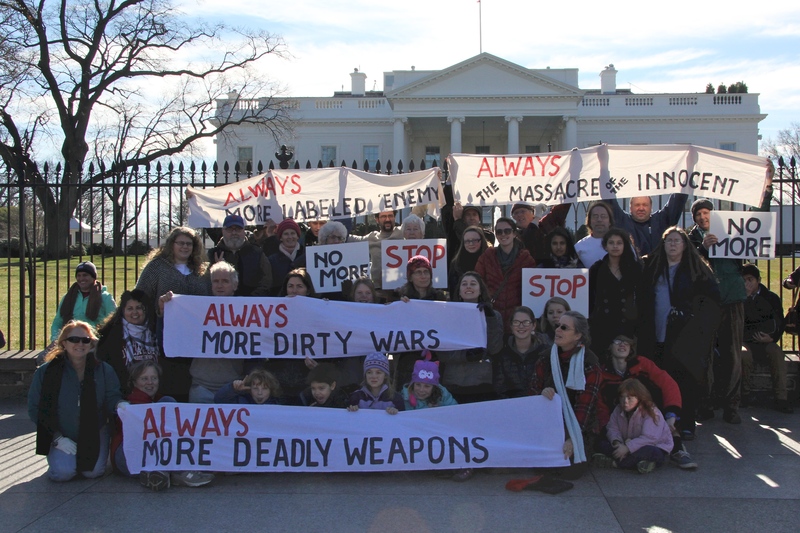 The witness began with a group photo with banners in the restricted picture postcard area on the sidewalk directly in front of the White House (see attached photo by Bill Ofenloch). The group formed an arc on the street in front of the White House where banners and New Year’s Resolution signs were displayed. Following a brief explanation about our presence, the gospel reading of the day was offered, the retreat theme statement was read and individuals holding a New Year’s Resolution sign read aloud their resolution. The response to the eighteen resolutions was: “Let’s Make It Happen Now.” (see New Year’s Resolution’s below). This was followed by singing “The Coventry Carol.” After repeating this sequence twice, the vigil ended with singing the “Vine and Fig Tree” song. The retreat concluded with a farewell greeting of peace for all gathered. As we enter this New Year of 2014, let us recommit ourselves to uphold the sacredness of all life and creation as we seek to establish the Beloved Community and help usher in God’s reign of love, justice and peace. Every hour of every day, the United States military magnifies destruction across the globe. 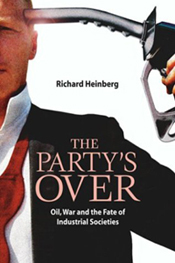 From overt wars to covert “dirty wars,” lives are destroyed, families torn apart, people disappeared. Every second of every minute, the world’s addiction to oil, natural gas and nuclear power is the cause of environmental contamination that is threatening global devastation. And always, the existence of nuclear weapons puts all life in utter peril. On this Feast of the Holy Innocents we respond to these horrors with a resounding “No!” This is a time when we call for transformation and resolve to magnify God’s creation with joy. We come to the White House to remember all the victims of our empire’s war making and oppression, to call on everyone to nonviolently resist state-sponsored violence and injustice, and to announce our New Year’s resolutions as we begin a new year. We invite you to join us in making these resolutions a reality as we strive to create the beloved community and a nonviolent world. Abolish All Nuclear and Conventional Weapons Now! Halt All Research on Nuclear Weapons Now! End the U.S. Wars in Afghanistan Now! Stop All U.S. Drone Attacks in Pakistan, Afghanistan,Yemen, Somalia, and Elsewhere Now! Repent for 22 Years of U.S. Warmaking in in Iraq and Make Reparations to the Iraqi people Now! End the Israeli Occupation of Palestine Now! Stop Global Warming—Climate Justice Now! Close Guantanamo, Bagram, SOA and All Military Torture Centers Now! Save the World’s Children Dying From Poverty Now! Demand Universal Health Care Now! Live, Practice, and Teach Nonviolence Now! Tear Down the Border Wall and Welcome the Immigrant Now! Stop the U.S. Militarization of Space Now! Money For Human Needs Not for Wall Street and the Pentagon Now! Money for Schools Not the Prison Industrial Complex Now! Stop Construction of the U.S. backed Naval Base on Jeju Island Now!